Nymphaea caerulea, better known as the blue lotus flower, is actually a gift to the world. Originally found on the banks of the river Nile, the Nymphaea caerulea, also called the blue lily, today is found all over the world including the Indian sub-continent. This beautiful blue flower is considered sacred by Indians, especially the Buddhists. Historians have always considered the blue lily symbolically rich and associated it with the ancient Egyptian culture. But recent studies have revealed that it has healing properties as well. Nymphaea caerulea was used by ancient Egyptians as a stimulant to increase sexual desire. It was also a symbol of the Egyptian deity ‘Nefertem’. Today we know that the sacred blue lotus can be used for a variety of medical purposes (Voogelbreinder 2009, 247). It can be used to make various healthy concoctions including blue lotus tea, wine and martinis! All you need to do is to soak the petals for up to three weeks to obtain the intoxicating beverage. 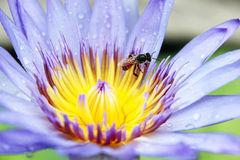 Blue lotus ‘tea’ can easily be prepared by boiling the flowers for 10–20 minutes. No matter how you consume or use it, the Nymphaea caerulea will surely provide your body with tons of health benefits! At Bare Beauty we have decided to use these amazing properties in our skin care range, aptly named the Sacred Blue Lotus Skin Care Range! In many countries extracts from the seeds, petals and stamens of nymphaea caerulea are used in the preparation of skin care products that provide instant hydration to the skin. So if you suffer from dry, flaky skin, use this oil in your natural moisturizer and flaunt your new found glowing skin! So you have oily skin? No worries; the blue lotus has something for you too! 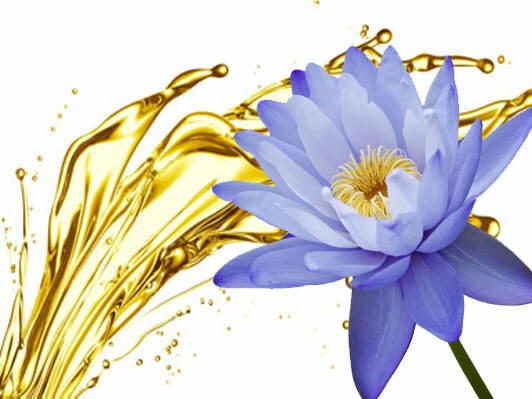 External use of blue lotus can balance oily skin and prevent pimple and acne breakouts. The blue lotus contains ginseng, which gives it anesthetic properties. This blue symbolic flower has the potential to regulate your urinary system. (Voogelbreinder 2009, 247-248). If a person is suffering from constipation, then medicines made from nymphaea caerulea can really help. (Ratsch 1998, 399). The use of this flower or its extracts can help regulate irregular periods and ease menstruation cramps. Diabetic complications such as cardiovascular problems are potentially regulated by this sacred water lily. (Voogelbreinder 2009, 247-248). Studies show that this sacred flower acts as a pain killer like Arnica and also has muscle relaxant properties. So, if you are suffering from nerve disorders, use this flower for pain relief and well as relaxation. (Voogelbreinder 2009, 247-248). A steroid known as Nymphayol present in these flowers is scientifically responsible for anti- diabetic activity. This steroid performs its duty by healing the endocrine tissues which are damaged. It even has the power of stimulating insulin secretion in beta cells. Researchers reveal the fact that rhizome of this plant contains starch and can be used as a tasty food! Whether eaten roasted or raw, the rhizome as well as roots of the blue lotus flower is indeed very nutritious. Rhizomes are even used to make medicines. The stalks are eaten as vegetables. Large proportion of nutrients like protein and tannin are present in the seeds. Extracts of this flower contains anti- oxidant, which helps the body remain young. The all-in-one nymphaea caerulea provides a warm pleasant feeling. It is one of the best natural health enhancing tonics that has ever been found.